Présentation en anglais Stories for children, histories of childhood Histoires d'enfant, histoires d'enfance The place of the child and childhood in our culture and his/her legal status is a subject which touches a sensitive nerve and triggers passionate responses just as much at the start of the 21st century as it did two hundred years ago. 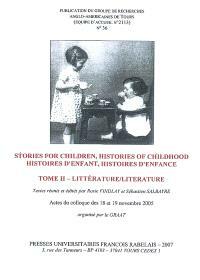 Curious then to note that the academic study of childhood had long been neglected by social historians while its literature, with a few notable exceptions, had too often been relegated to a minor category when not simply dismissed as « pulp fiction ». Over the last two decades or so pioneering research has begun to redress this balance and paved the way towards a reappraisal of the child and childhood as a valid field of study. At the same time, by highlighting the areas which still require exploration, it has underlined the distance we still have to cover in order to achieve a balanced integration of both the child and childhood into the social and cultural « story » of our past. It is hoped that the papers published here will, in their own modest way, contribute to this ongoing process of replacing the child inside a culture which proudly claims to have created the golden age of childhood.